Rockfalls are frequent natural processes in mountain regions with the potential to produce damage. The quantitative risk analysis (QRA) is an approach increasingly used to assess risk and evaluate the performance of mitigation measures. In case of the fragmentation of the falling rock mass, some of the hypothesis taken in the QRA estimation for rockfalls have to be modified since a single block or rock mass can produce several fragments thus modifying the runout probability, the impact energies and exposure of the elements at risk. 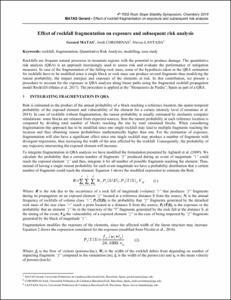 In this contribution, we present a procedure to account for the exposure in QRA analysis along linear paths using the fragmental rockfall propagation model RockGIS (Matas et al. 2017). The procedure is applied at the “Monasterio de Piedra”, Spain as part of a QRA. Matas, G., Corominas, J., Lantada, N. Effect of rockfall fragmentation on exposure and subsequent risk analysis. A: International Symposium Rock Slope Stability. "International Symposium Rock Slope Stability 2018: proceedings". 2018, p. 99-100.